A major undersea earthquake occurred south of Indonesia on Monday, triggering a local tsunami that hit the island of Java. At least 340 people are dead and more than 42,000 people displaced after a 6-foot-high wave crashed ashore on the island's southern coast, destroying homes, hotels and restaurants, according to an Associated Press report. Pangandaran Beach, in western Java, appeared to be hardest hit. 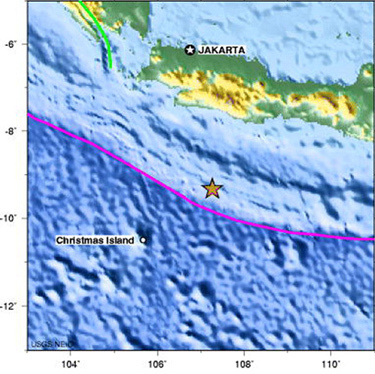 The tsunami was triggered by a magnitude-7.7 earthquake that struck deep beneath the Indian Ocean, 355 kilometers (220 miles) south of the Indonesian capital of Jakarta at 3:19 p.m. local time, according to the U.S. Geological Survey. An earlier estimate classified the quake as a magnitude 7.1. Several aftershocks followed the main quake. The orange star marks the location of the magnitude-7.7 earthquake's epicenter, 360 kilometers south of Indonesia's capital, Jakarta. The earthquake triggered a tsunami that hit the island of Java. Image is courtesy of the U.S. Geological Survey. The Pacific Tsunami Warning Center (PTWC) in Hawaii issued a tsunami watch for Indonesia and Australia at 3:36 p.m. in response to the earthquake. The watch bulletin warned of a local tsunami that could affect coasts within 100 kilometers of the quake's epicenter and cause small sea-level changes and unusual coastal currents in areas farther away, but stated that a widespread tsunami was unlikely. At 3:46 p.m., the Japanese Meteorological Agency (JMA) also issued a watch. The National Oceanic and Atmospheric Administration (NOAA) received word at 4:30 p.m. that a tsunami had been detected, says Greg Romano, a NOAA spokesperson. According to the Associated Press report, word of the tsunami-watch bulletins did not reach the victims because the government did not announce them and because Java does not yet have a notification system in place. At present, PTWC and JMA share responsibility for issuing tsunami watches in the Indian Ocean, Romano says, but local jurisdictions make the decision whether to issue warnings to communities based on these watches. While the Indian Ocean currently has some devices in place for detecting earthquakes and tsunamis, work to create a more robust warning system similar to the one that exists for the Pacific Ocean is still in progress. More devices will eventually be added to the Indian Ocean network, Romano says. Since the devastating December 2004 Sumatra earthquake and subsequent tsunami, which killed more than 200,000 people, the Intergovernmental Oceanographic Commission of UNESCO has been coordinating the establishment of an Indian Ocean Tsunami Warning System. Earlier this month, UNESCO Director-General Koïchiro Matsuura announced that 26 of 28 possible national tsunami information centers in the Indian Ocean region will be capable of receiving and distributing tsunami advisories around the clock by the end of the month, with more instrumentation coming online in late 2007 and 2008.